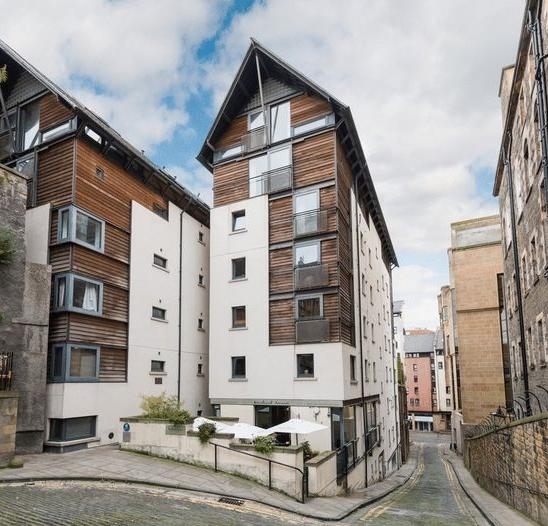 A beautiful apartment just off the Royal Mile, equipped comfortably and to a very high standard for up to 6 guests, Eve's Old Fishmarket Close offers luxury and seclusion in the heart of Edinburgh's Old Town. 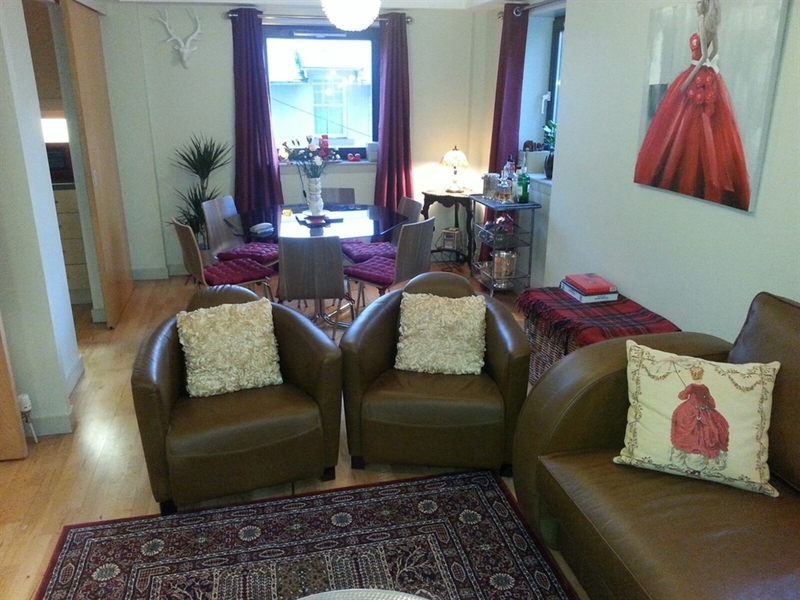 This beautiful apartment has been completely updated and redecorated. I manage it myself, without the involvement of agencies, and always try to greet guests personally. 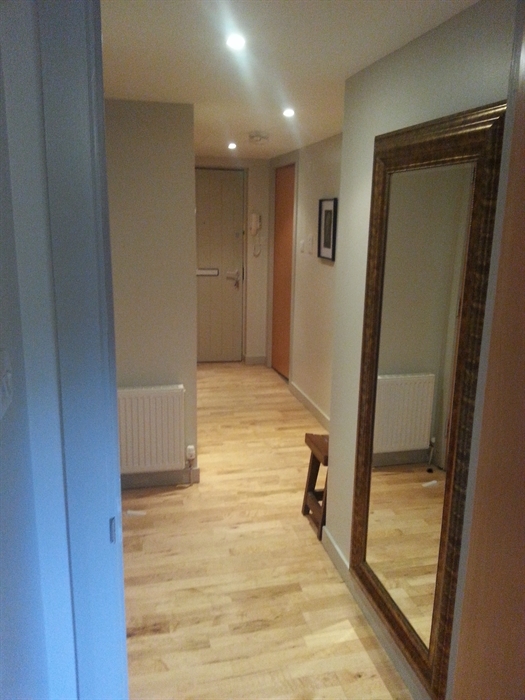 It is on the second floor, with lift and secure entry system, and it is wheelchair accessible. 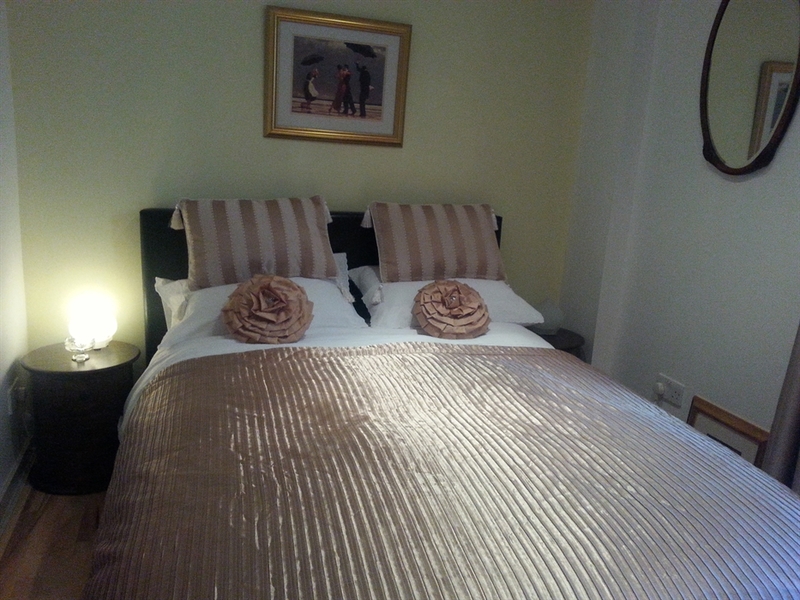 The two bedrooms each have a double bed, and built-in wardrobes; the bedding is of a high standard and anti-allergenic, and the pillows are of various densities to suit guests’ different preferences. 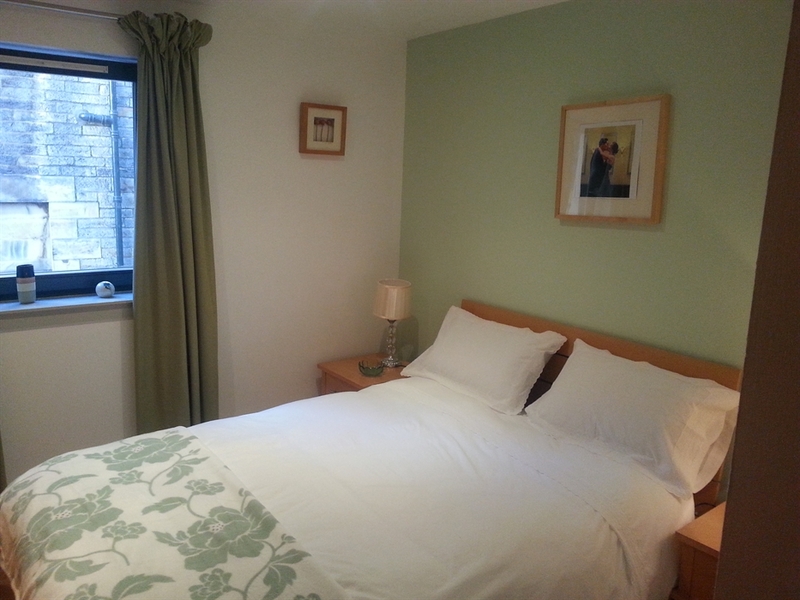 Each bedroom has a fan available, should it become too warm. Hair dryers and straighteners are also located in the bedrooms. The large living room has a wall-mounted television with Freeview channels, and a PlayStation with Blu-ray player and a selection of games and DVD's. There is a CD player, with various CD’s. Free Wi-Fi/broadband internet is available. 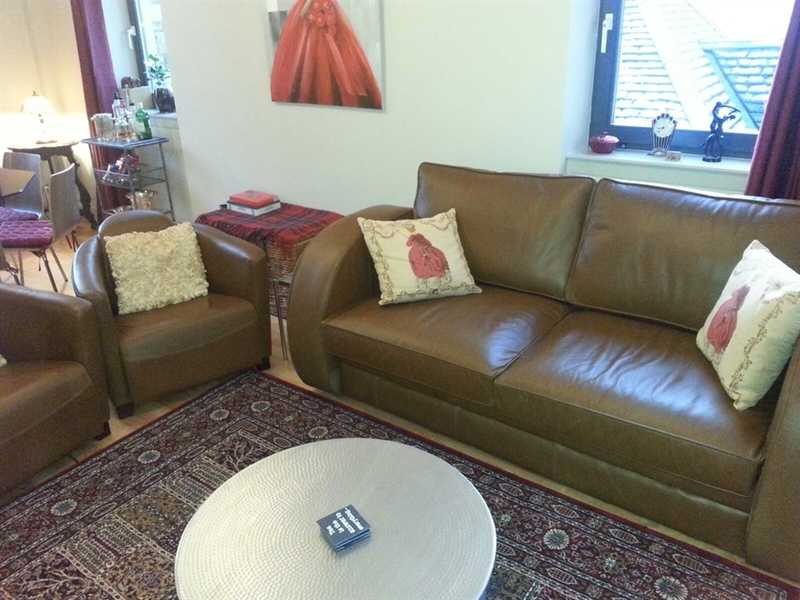 A large leather sofa bed and two leather chairs provide comfort and a homely touch. 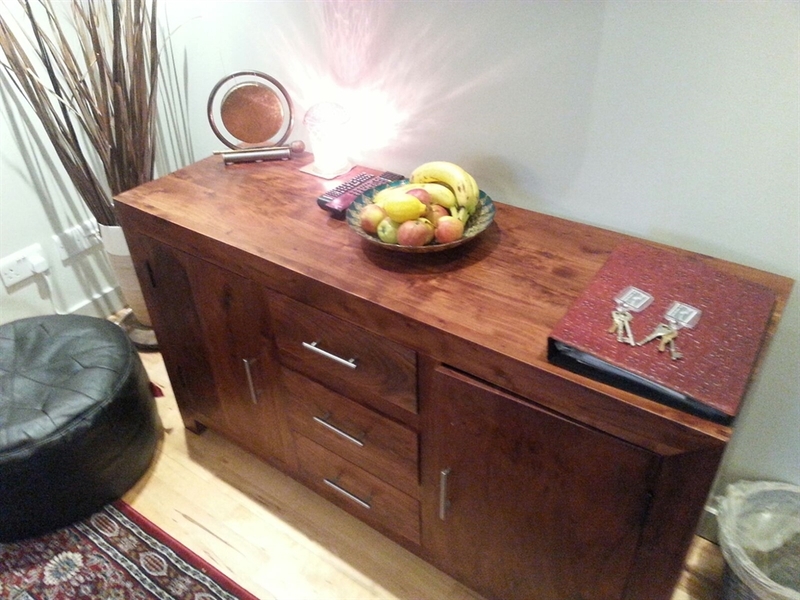 The sofa bed is brand new and hand made, with a large, extremely comfortable mattress.The room has four windows, and it is quite a light and airy space. 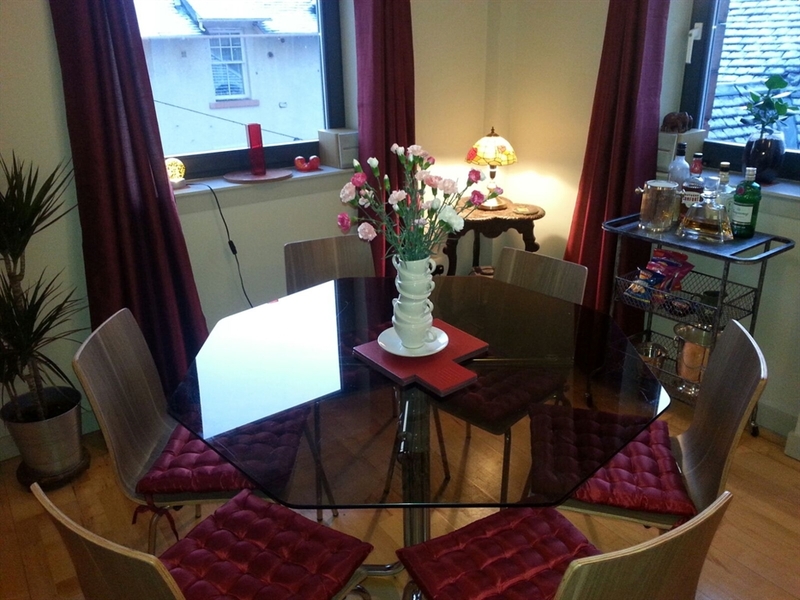 There is a dining area for 6 people, with an original 60's retro glass table. 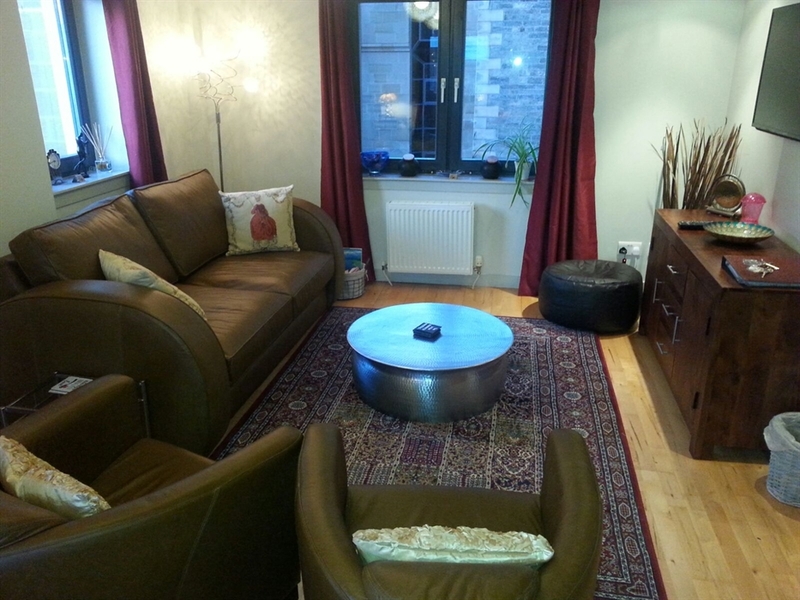 The whole room exudes comfort, with low lighting, drinks trolley, cushions and a soft rug on the floor. I tried to stay away from the 'hotel' look and went for 'comfy' instead. 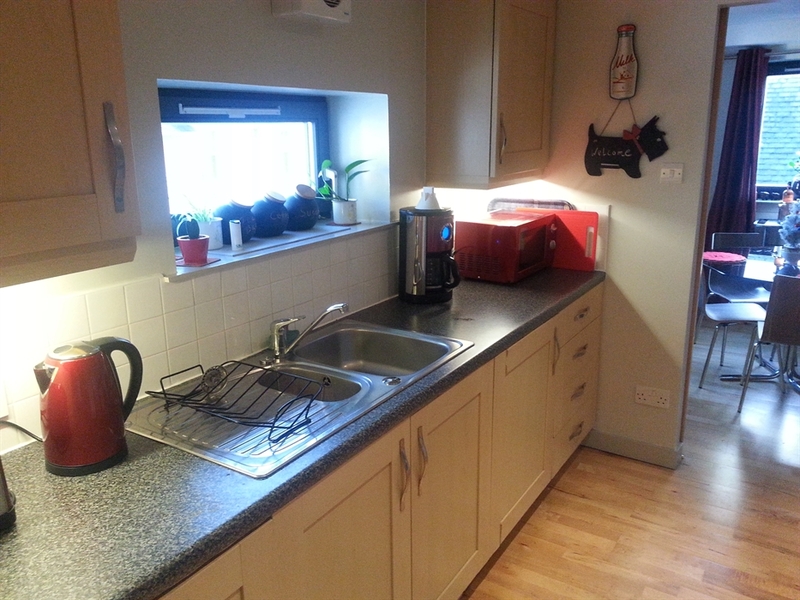 A modern, well-equipped kitchen provides everything you need, with a gas hob, electric oven, full-sized dishwasher, washer/dryer, fridge/freezer and coffee percolator. All kitchenware and crockery are of a high standard. I provide a generous welcome supply of groceries (milk, bread,water, butter, juice, sugar, teas, coffees, fruit, eggs from my own hens, home made jams, biscuits and breakfast cereal). 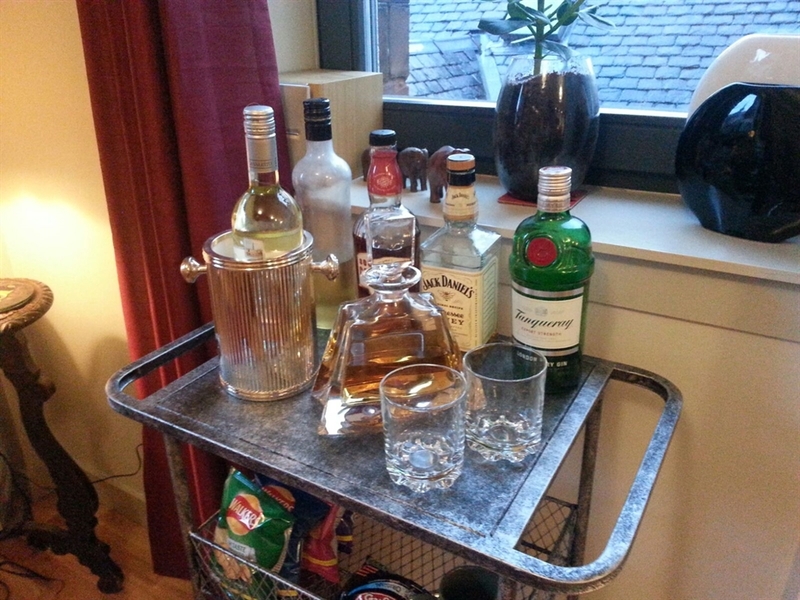 I always leave chocolates, a bottle of wine and some whisky for my guests. 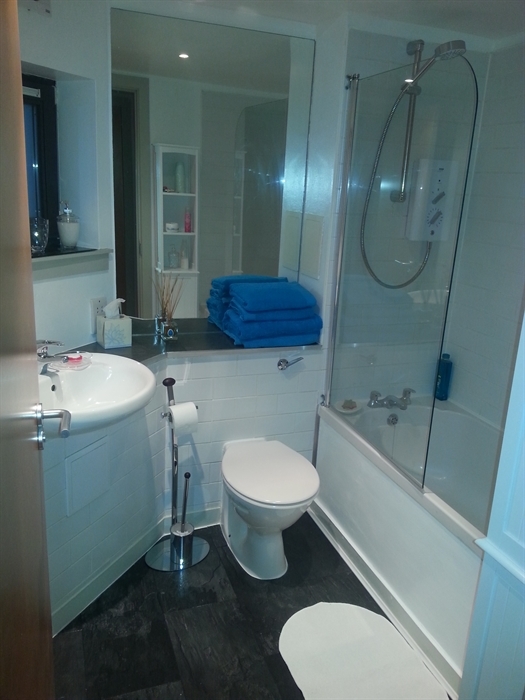 The bathroom has a bath with a new shower overhead, my handmade soaps, shower gel and shampoo. 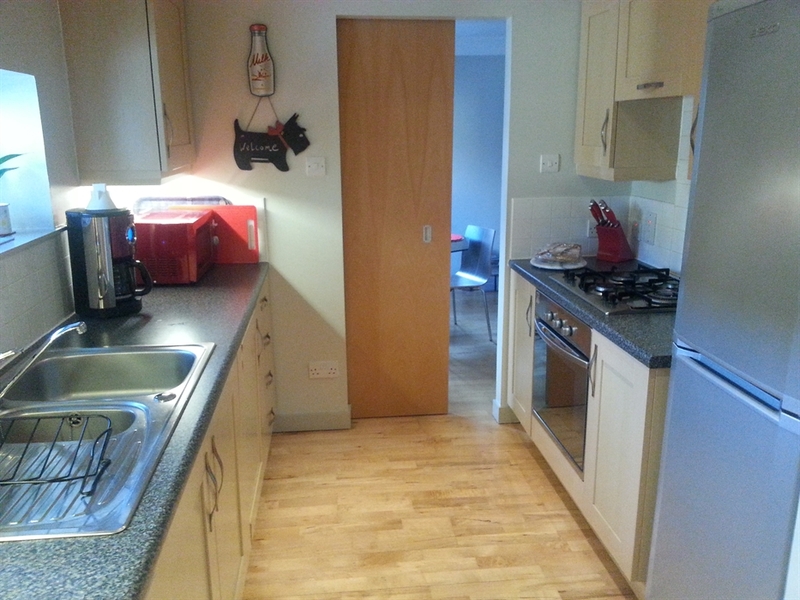 I provide all cleaning materials, toilet rolls, linen and towels. A travel cot and high chair can be provided, these should be requested at time of booking. In the basement is a bike storage area. For an extra fee, I can offer red roses and champagne for special occasions. 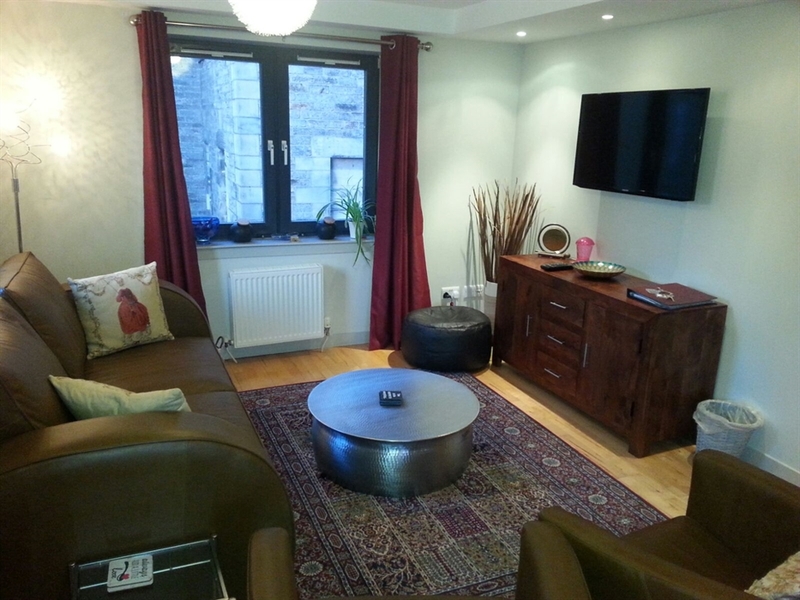 The apartment is right in the centre of the Old Town, on the Royal Mile, and there is parking on Kings Stable Road (a six minute walk), or by Waverley Station (about 5 minutes), but you do not need a car for this city break, you are right in the centre of town. 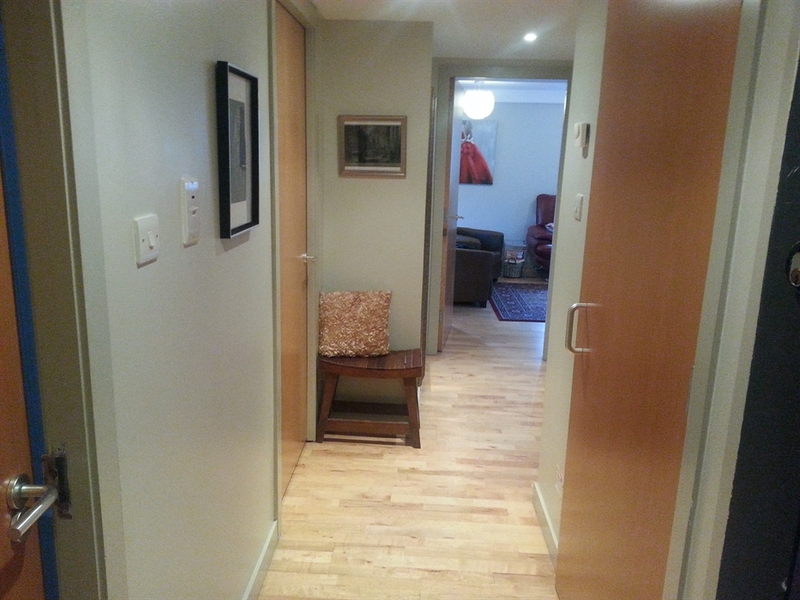 This is a perfect base for exploring the city, and Old Fishmarket Close is steeped in History. I recommend one of the Ghost tours, where you can find out about Old Edinburgh. 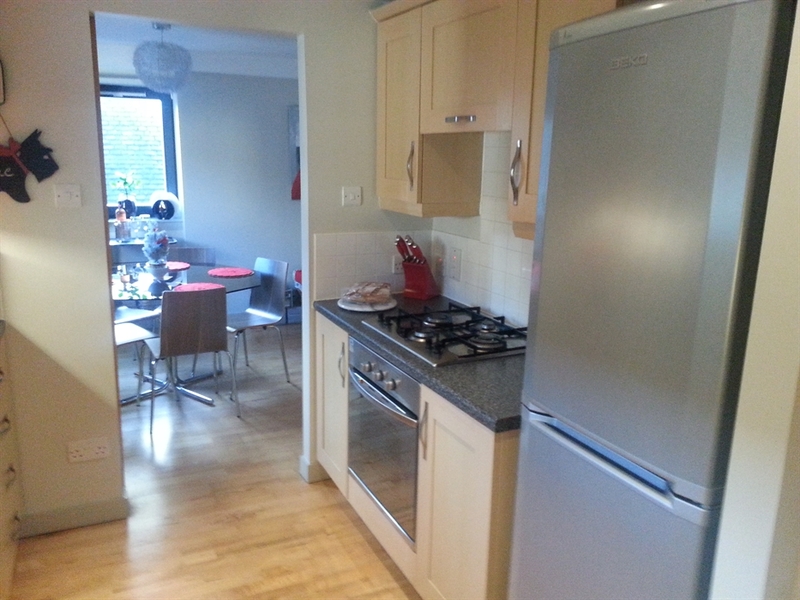 Restaurants, bars and sights are on your door step, a vast range of shops are about 4 minutes away, on South Bridge. The castle is just a short walk up the Royal Mile. St Giles Cathedral is just around the corner. It is a beautiful, historic part of Edinburgh. You have a choice of theatres, music venues and night clubs. Edinburgh's famous Jazz Bar is only about two minutes from the Apartment, as is the National Museum of Scotland. If you are a shopaholic, Princess Street is for you. It is a short walk down into the New Town, through Princess Street Gardens. Or you could visit Holyrood, the home of the Scottish Parliament and Holyrood Palace. While you are there, try to scale Arthur's Seat, a dormant volcano, which will give you an excellent view over Edinburgh and is the site of a well preserved fort. The Apartment really is at the centre of all that.